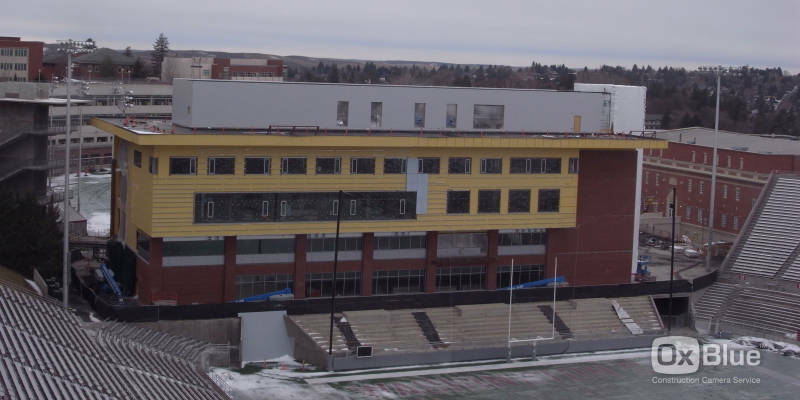 Sun., Dec. 29, 2013, 6:15 p.m.
Pullman -- Washington State Athletics has an update today on the status of the Football Operations Building (FOB), which is still under construction next to Martin Stadium. The 84,000 square foot facility will house training rooms, weight rooms, coaches' offices and more. Schedule to be completed in the Spring of 2014, you can watch a live feed of the construction here. If you watch at night, you'll notice that the building appears to have electricity, a recent development (recent relative to the final bowl practices). The FOB is part of the Cougar Football Project, a two-part renovation of Martin Stadium. More updates and photos from the Cougar Football Project can be found on its Facebook page.